The Birth of B.A.S.S. actually began in March of 1967. Ray Scott at this time was a 33 year old insurance executive from Montgomery, Alabama. Scott liked the insurance business but not as much as he enjoyed bass fishing. While selling insurance in Jackson, Mississippi he brought his fishing tackle along with the intention of getting some bass fishing in. Mr. Scott made arrangements with a local fisherman to fish the Ross Barnett Reservoir. It was a cold and windy day and by midmorning the waves were battering the small flat-bottom boat. The fish were not biting and they now were nearly frozen so they decided to call it quits. Ray Scott drove back to his Jackson, Mississippi motel and after a hot shower he kicked back and while watching a sporting event on TV the story goes is when he came up with the idea for a honest bass fishing tournament that would attract the right kind of fishermen. There would be entry fees and rules that would guarantee a fair contest. The next day Mr. Scott flew to Little Rock, Arkansas because he knew of a new impoundment called Beaver Lake in Arkansas. He had just read about this lake in an Outdoor Life article and knew that this would be the lake to have his first tournament on. If the tournament turned out to be a big flop he could simply go back to Montgomery selling insurance and no one would be the wiser. After arriving in Little Rock, Mr. Scott had arranged to meet with the Department of Tourism. 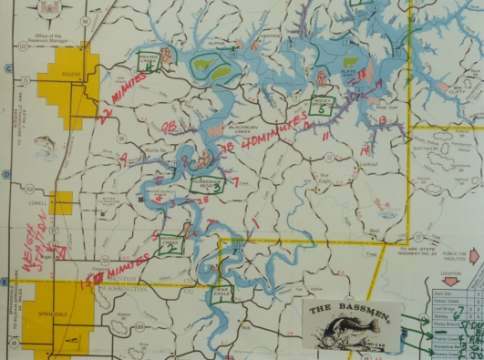 He met with the state director of tourism and told him of his idea of having a bass tournament on Beaver Lake and asked what towns would best serve as a headquarters. The Director of Tourism suggested two beautiful little towns, either Rogers or Springdale, Arkansas. Mr. Scott first contacted the director of the Rogers Chamber of Commerce and asked if he would be interested in serving as a sponsor for his bass tournament. He was quickly turned down so that left Springdale. Scott contacted Lee Zachary and set up an interview with him. Mr. Zachary told Scott the Chamber of Commerce would have to vote on whether it would sponsor the bass tournament event. The Springdale Chamber of Commerce also voted not to sponsor his event because they had never heard of a bass tournament and they were afraid that Scott would leave town with the entry fee money and this would be bad publicity. Joe Robinson a real estate developer and Sr. Stanley Applegate a large share holder of the Hickory Creek Boat Dock did not believe this. 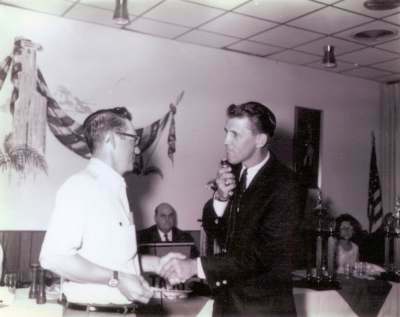 Mr. Applegate was looking for someone to help promote interest in Beaver Lake so he loaned Mr. Scott $2,500 for expenses. Ray Scott had funds to operate but was desperate for the $5,000 prize money he needed for the event. Scott and Robinson made a visit to Daisy-Heddon and offered Heddon the sponsorship for the tournament. Heddon also turned him down because they had exhausted their advertising budget for the year. Mr. Scott now returned to his small office in the Springdale Chamber of Commerce building and tried to drum up entries for the All-American Tournament. Mr. Scott said "We had to make it seem like a big deal, so we sent out invitations to make people think that being invited was an honor". Scott now says that "Everybody could be a nominator". The card has the name of the nominator and below the names of the good fishermen he suggested. One of the first four names Mr. Scott had was Tom Mann a fishing tackle manufacturer in Alabama. Scott talked to Mann and invited him to the All-American tournament and he also got the names of several other fishermen from Tom Mann. They all were sent an invitation. Most of the fishermen that were sent an invitation did not call back. At this time Scott had only 35 entries for the tournament. Scott went to Joe Robinson's office and said if he wanted he would go home and forget the whole thing. Joe said he has enough funds and if we come up short we're going to show regardless. The tournament will be held June 5,6 & 7, 1967 at Beaver Lake, Arkansas. Beaver Lake is the newest of the impoundments of the famous White River of Northwest Arkansas. 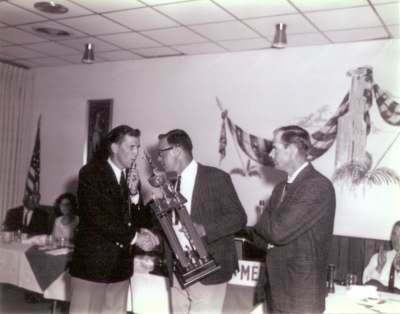 April 19, 1967 Ray Scott sent an invitation to Clyde A. Harbin Sr. to participate in the First Annual All-American Invitational Bass Tournament. Mr. Fred Miller of Walls, Mississippi recommended Clyde Harbin Sr. to Ray Scott for this bass tournament. Things now began to fall in place for Ray Scott because a fishing team from Memphis, Tennessee decided they were going to fish in the tournament. The team called themselves The Memphis Bassmen. Johnny Tate - Owner Electronic Repair * Sponsor: Berl Olswanger Music Inc.
Bill Dance - Stratton-Warren Hardware Co.* Sponsor: Ford Motor Co.
Charles Spence - Douthit-Carroll Pontaic Co. * Sponsor: Douthit-Carroll Pontaic Co.
May 1, 1967 Clyde A. Harbin CHALLENGED Tulsa to a fish off. Mr. Harbin heard that around the Beaver area there was a bunch of Tulsa fishermen that could catch bass all day. Mr. Harbin said that Memphis has some good bass fishermen and they didn't think there was another group that could out fish them even if it's their home grounds. This was Mr. Harbin's deal - At the end of the All-American tournament the top ten scores from each team will be added up and the team with the highest score is the winner. The winners will get the privilege of picking one bait from the opposing Loser's tackle box. Mr. Harbin explained that this may not sound like much, but for himself being able to pick out any bait he wants from a man's tackle box is a rare privilege. Mr. Harbin has 225 treble-hook baits in his tackle box so his offering would be like shopping in a tackle shop. Finally Mr. Harbin said he will make up identification badges declaring "I Beat a Memphis Bassman" to be worn by Tulsans if they should win. 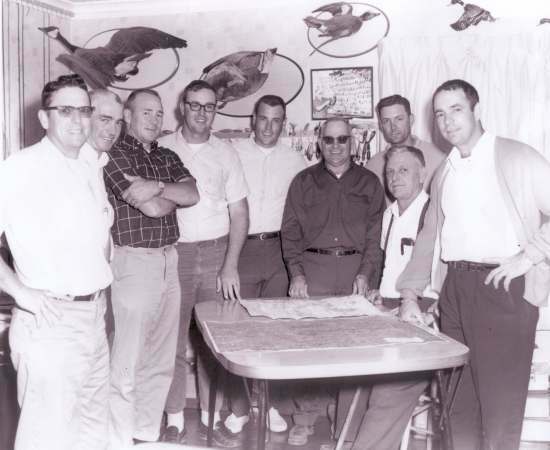 May 5, 1967 Clyde A. Harbin Sr. visited Springdale, Arkansas to confer with Ray Scott and scout Beaver Lake for the Memphis Bassmen fishing team. 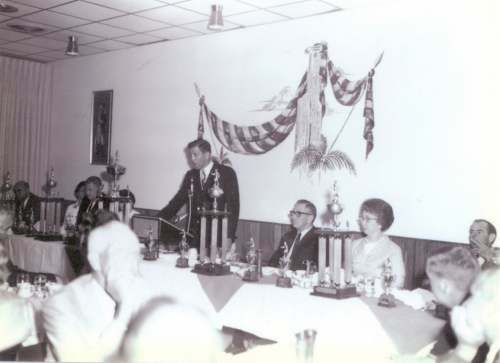 Mr. Harbin was captain and spokesmen for the Memphis Bassmen Team. 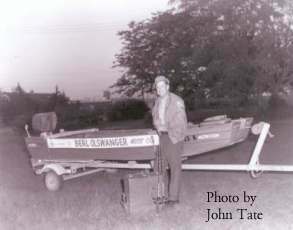 He was seeking information for the services on the lake and visited three boat docks that week. Johnny Leisure, Rocky Branch boat dock operator took Mr. Clyde Harbin out on his boat for a tour of Beaver Lake. After a short time Mr. Harbin landed a 5 1/4 pound bass which turned out to be the third largest bass caught that day. Clyde also hooked into another large one but did not land the fish. 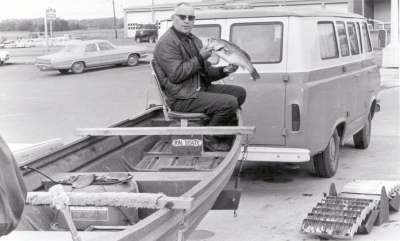 Clyde A. Harbin Sr. of Memphis shows off a 5-1/4 pound black bass he caught on a scouting mission at Beaver Lake for The Memphis Bassmen proving he knows what he is talking about. Harbin's tackle box is one Tulsa anglers could pick from. 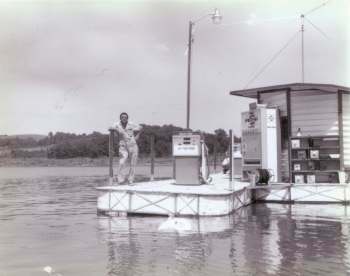 War Eagle Boat Dock, Beaver Lake - As team Captain of the Memphis Bassmen Mr. Harbin visited each boat dock. He made lake maps with driving times to the weigh in location. Mr. Harbin describes himself and his Memphis fishing friends as just a bunch of dedicated bass fishermen that fish real hard. We don't think anything about getting up and traveling 300 miles to go fishing. We'll make a 600 mile trip in a 24 hour period just to fish. 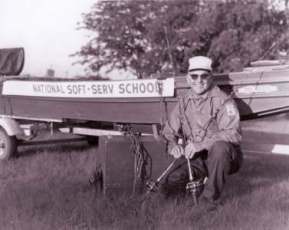 Mr. Harbin made his survey of the Beaver area driving his homemade version of a complete fishermen's vehicle. He re-modeled a Ford Bus with all the comforts of home including double bunks, running water, carpets and a FM radio among other things. A vehicle like this is needed because they have fished in areas sometimes way back in the boondocks where there are no accommodations just like when the Indians lived there. 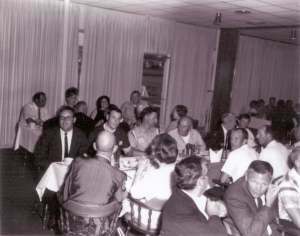 May 10, 1967 Tribune Outdoor Editor, Bob Cobb writes about the Memphis Bassmen Challenge to out fish Tulsa Anglers. The Tribune was asking for 10 to 15 of Tulsa Counties best bass fishermen to fish against the Memphis, Tennessee Bassmen who claim to be the Kings of Bass Fishing. Interested fishermen should inquire at the Outdoor Desk of The Tribune. Cobb admits that Harbin sounds like a good bass fisherman and if the rest of the Memphis Bassmen are like him they will have to line up a real good team if they are to beat them. Cobb reported in case the word "invitational" on the All-American listing bothers you not to sweat it. Ray Scott, director of the tournament has listened to the Tulsa appeal and guaranteed us as many invitations as needed. The tournament is the first big prize fresh water bass fishing tournament to be held. 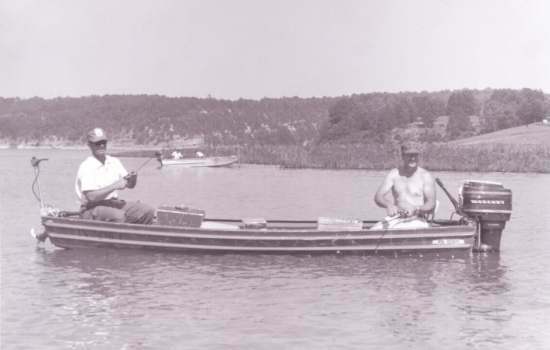 Clyde A. Harbin Sr. made the May 1, 1967 CHALLENGE that the Memphis Bassmen can out bass fish any other team and Mr. Harbin also made the May 11, 1967 Team Rules. The Memphis Bassmen should be 15-20 in number to fish the tournament. Mr. Harbin as team captain challenged the following cities for a team event: Tulsa, Oklahoma - Jackson, Mississippi - Lexington, Kentucky and Bowling Green, Kentucky. In no matter is this challenge to be taken in the light of money betting. In no matter is this challenge to be taken in the light of to be questioning their Bass Fishing Ability---we will just fish the best Bassmen. No Less than Five or no more than the Ten Top Scores to count in the team total score. Team Winners to pick only one bait from only one of the tackle boxes of each looser (3 teams entered the pick is only two baits per winner). 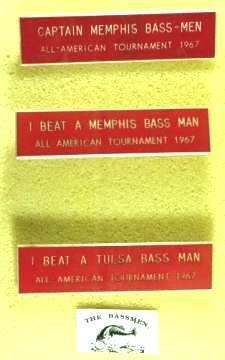 Each team that beats the Memphis Bassmen will receive a Lapel Plate, 3/4" x 3" with clutches (fasteners)' red bar with white letters engraved: "I Beat A Memphis Bassman....All-American Tournament 1967". We expect the same Lapel Plate from each team that we beat. The Memphis Bassmen will be picked only from Metropolitan Memphis and Shelby County, Tennessee. We expect you to limit your team membership to your Metropolitan area. 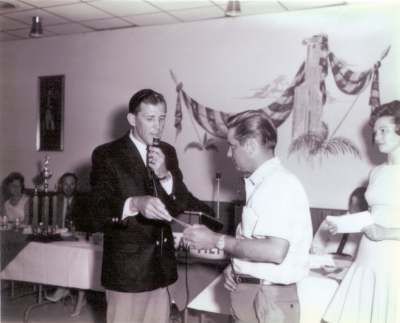 The original idea of the Challenge was to help Ray Scott in the promotion of the First All-American Tournament and because of rule number 3, Teams of no Less than Five the Lexington, Kentucky and the Jackson, Mississippi teams could not accept Mr. Harbin's Fish Off Challenge. May 29, 1967 Ray Scott forwarded a copy of the News Release that he sent to newspapers to Clyde Harbin. The Top Bass Fishermen will be competing in the All-American Invitational Bass Tournament, June 5-7 on Beaver Lake, Arkansas. There are 106 entries coming from 14 states with an entry fee of $100. Participants will be competing for the All-American title and Champion Trophy. Cash prizes of $5,000 will be shared by the top ten fishermen. The first place winner will receive a $2,000 cash prize plus an expense paid fishing vacation in Acapulco, Mexico. Second place winner will receive $1,000 cash prize along with a trophy and more cash prizes were awarded through the tenth place winner. Joe Robinson had rented official scales from a grocery store to weigh in the fish. He also was a former member of the Arkansas Game and Fish Commission and he prevailed on a dozen game wardens to be at the tournament in uniform to weigh in the fish. By the week of the tournament all the hard work and long hours that Scott and Robinson had put in paid off. 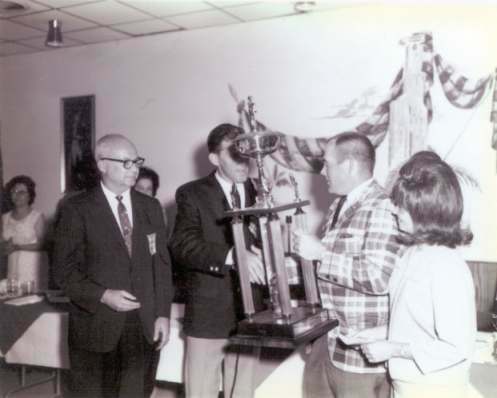 Especially the efforts of Clyde A. Harbin Sr. because it was not until The Memphis Bassmen team entered the tournament and Mr. Harbin made the fish off Challenge to Tulsa and other bass teams that the contest entries were boosted from 35 to 106 entries. Some of The Memphis Bassmen at the Pre Tournament Meeting. It was an amazing sight to see. The morning of June 6th dawned sunny and bright and at marinas around the lake the boats waited for the start of the tournament. 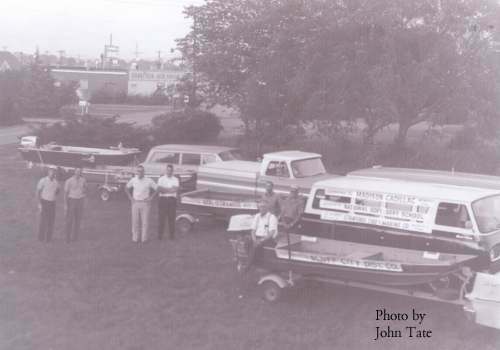 There were many different styles of boats at the first tournament and most of the fishermen at this time attached the trolling motor to the transom of the boat rather that at the front of the boat. At the end of the day they will return to the same spot and then trailer their boat to an area provided by a turkey farmer for the weigh-in located between Springdale and Rogers. At the weigh in there were a few large stringers of bass but there were more little fish than big ones. One fisherman brought in nine bass that weighed only 10 ounces. Bill Dance from the Memphis Bassmen claimed the honor of catching the first bass ever caught in a bass tournament. He had a 60-horse power motor and he could go faster than most of the other boats. Bill caught a fish on his first cast and as he looked around he saw that most of the boats had not even reached their fishing spots. After three days of fishing Stan Sloan prevailed as the winner of the First All-American Invitational Invitation. Stan weighed in with 37lbs 8oz of fish he caught on a Bomber Spin Stick. The All-American Invitational Bass Tournament had been a success and Ray Scott went back to Montgomery proudly. One month later he resigned from the insurance business. The Memphis Bassmen Team Wins the Challenge made by Clyde A. Harbin - On the third day of the tournament The Memphis Bassmen charged forward and defeated the Tulsa Bass club 8,975 points to 8,354 points. 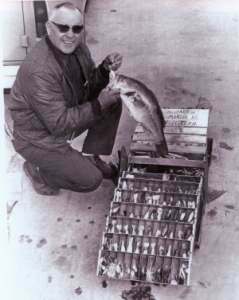 Clyde A. Harbin, captain of the Memphis Bassmen had the pleasure of picking a bait from Joe Dunham's tackle box. Joe was from the Tulsa Bass Club team. Comment from Floyd Roberts - Website Author: The First All-American Invitational Bass Tournament was a great success. I contribute much of this success to Mr. Clyde A. Harbin for his effort's in helping Mr. Scott in promoting this event. 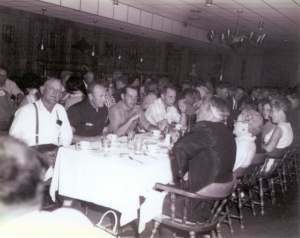 Mr. Scott only had 35 contestants in the tournament until the Memphis Bassmen entered the event and Mr. Harbin Challenged Tulsa, Oklahoma and other states to a fish off against the Memphis Bassmen. Mr. Harbin also made the May 11, 1967 Team Challenge Rules. This was the turning point for Ray Scott and his bass tournament. Mr. Scott received a large boost from 35 to 106 contestants and in the end the First All-American Bass Tournament was a success. 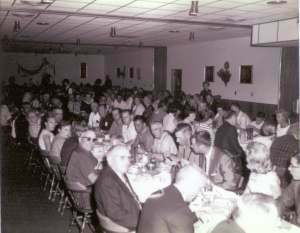 Ray Scott tells of a rival organization "The Professional Bass Fishermen's Association" that was started immediately after the First All-American Bass Tournament. 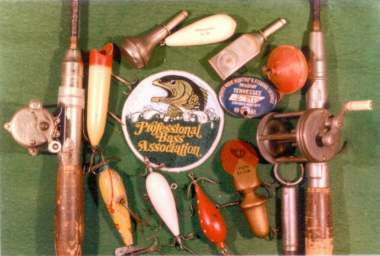 The Professional Bass Association was started by Glenn Andrews and Ed Howze from Memphis, Tennessee.